This week we’re going to use Northcott’s Urban Elementz fabric line to create a bunch of fun quilty projects in no time flat. Today’s project is this unique quilted version of X’s and O’s. It’s fun for the whole family and can be taken on the road and rolled out at any destination! 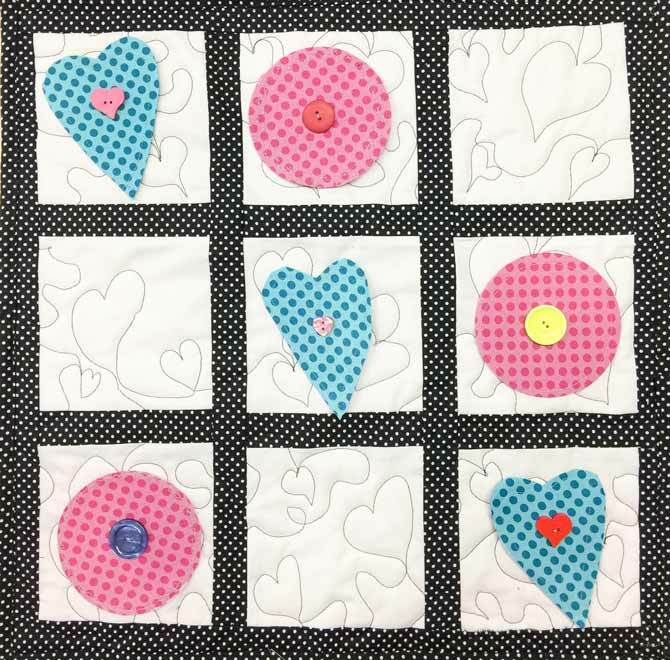 This quilted game consists of a ‘board’ or quilt that measures 19” x 19” as well as 5 heart shapes and 5 circle shapes that are used to play the game. Quilted travel game, played the same way as you play X’s and O’s. Let’s get started. This cool polka dot fabric is from Northcott’s Urban Elementz collection, and I love it! Cut the white fabric into nine 5½” squares. 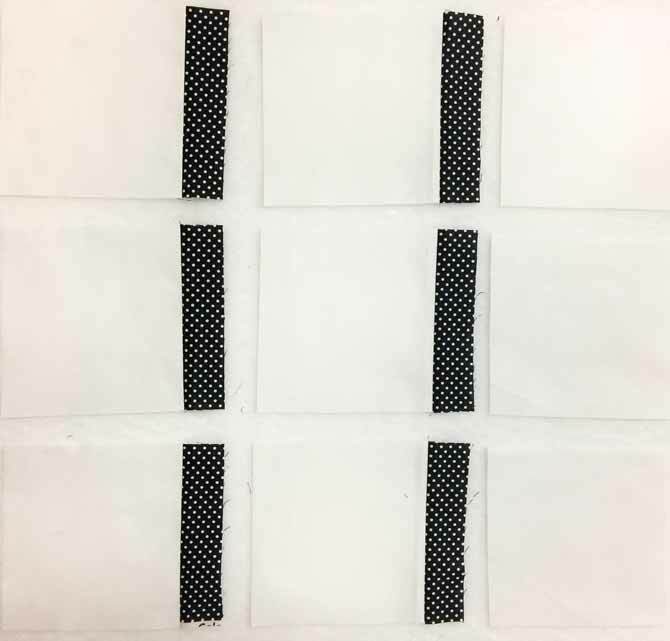 Cut the black with white polka dots fabric into six 1½” x 5½” strips, four 1½” x 17½” strips and two 1½” x 19½” strips. Save the remainder for binding. Sew a 1½” x 5½” black strip to one side of one of the 5½” white squares of fabric. Repeat five more times so you have six blocks with a strip down one side. Turn all of these blocks so the black strips are all on the right hand side. Lay out the blocks into three rows, so each row consists of two of the blocks made above and one of the remaining 5½” squares of white fabrics. See the photo below. 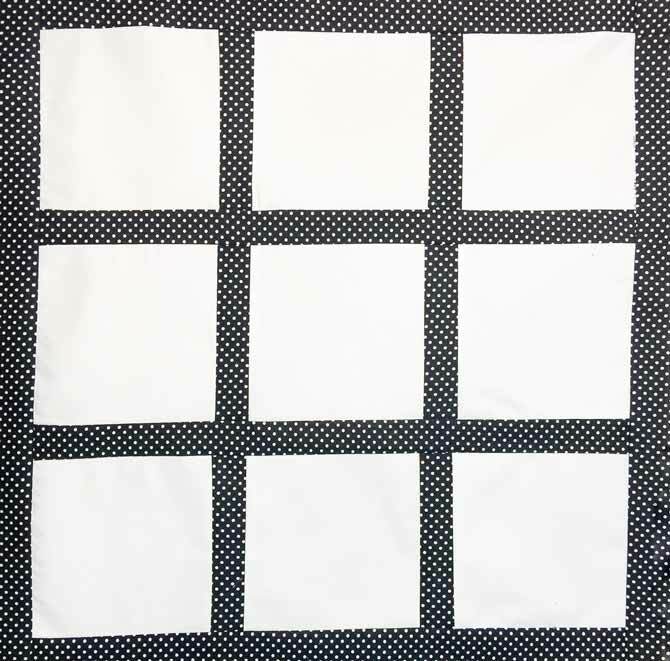 Sew the black sashing to six of the white squares and lay them out as pictured. Sew the blocks into rows and press. 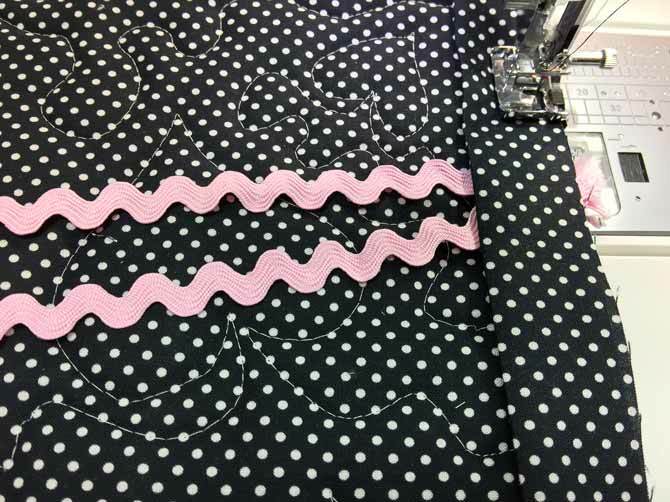 Next, sew a 17½” black sashing strip between rows 1 and 2, and between rows 2 and 3 and press. Sew the remaining two 17½” strips to the top and bottom and press. Sew the 19½” strips to the remaining two sides. Press. Quilt top with sashing and borders added. Next, I’m going to show you a fabulous way to help you figure out where to quilt. I usually have some vague idea of what I’m going to quilt and just hope for the best. But not anymore, not with this fancy schmancy UNIQUE SEWING Air Erasable Fabric Marker. This marker allows you to draw your quilting design directly onto your quilt sandwich and then you just go ahead and quilt. In 12-24 hours the marks are gone! Simply magic! As an added bonus, it’s now super easy for me to show you my plans for quilting too! As you can see, I’ve drawn hearts in a lot of places that I plan to free motion quilt. 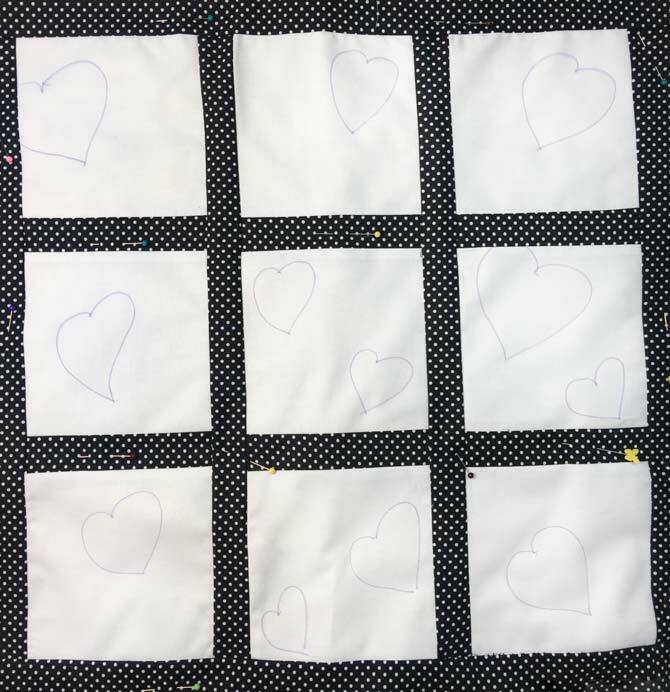 Quilt top with hearts drawn on it with an air erasable marker. Layer the quilt top with batting and backing and then quilt either by hand or machine. Once you have finished quilting, trim the edges with a rotary cutter and ruler. Cut the rick rack into two 12” pieces and pin one end of each to the back of the quilt along one of the raw edges. Sew the binding onto the sides of the quilt, securing the ends of the rick rack. Now, when you roll up the quilt, you just tie the two pieces of rick rack in a bow. The rick rack is pinned to the back of the quilt and sewn into the binding. 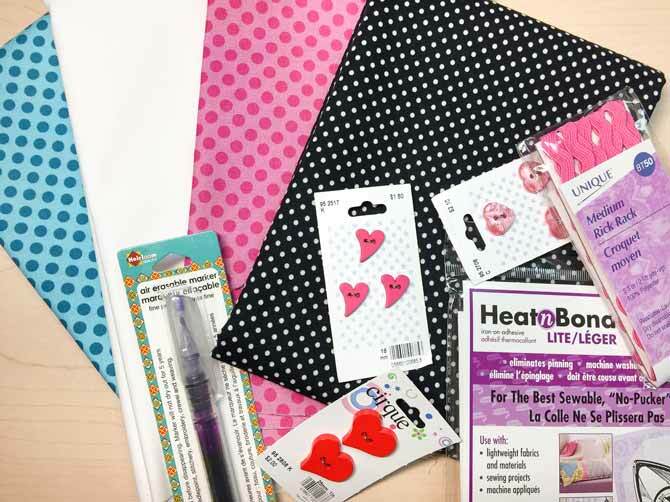 Come back tomorrow and we’ll use the Urban Elementz fabrics to make the circle and heart game pieces and finish our quilted travel game! Quilted travel game all rolled up and ready to travel!